At the time the book was published, the psychiatrist Bruno Bettelheim said the scary nature of the story wasn’t found with the wild things at all. It was found in the “time out” in the room itself. Being sent to one’s room alone, and without food, he argued, represents desertion, the worst threat a child can face. 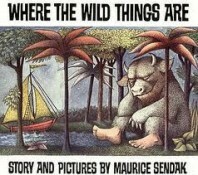 And maybe that’s what Sendak feared the most. It’s one thing for psychiatrists to be fussy about such things, but I’m amazed when Christians are. Some wag their heads at books such as Wild Things. They complain about how “dark” books like these are. Of course they’re “dark.” Isn’t that what the gospel is here to tell us? The universe is dark; dark enough to be overcome only by the Light of Galilee. Until we learn to communicate this to our children with winsomeness and gravity, Maurice Sendak will seem more realistic than Sunday school or catechism class. Too many of our Bible study and discipleship materials (whether for Baptist Vacation Bible School or Roman Catholic confirmation preparation or what have you) de-claw the Bible. They excise all the snakes and dragons and wildness. In so doing, they reduce the Bible to a set of ethical guidelines and a text on how gentle and kind Jesus is. The Word came into the world, and the wildness did not overcome it. “Death of a Wild Thing” first appeared in the Nov/Dec 2012 issue of Touchstone and is available online. Russell D. Moore is the author of Adopted for Life: The Priority of Adoption for Christian Families and Churches. He lives with his family in Louisville, Kentucky, where he serves as Dean of the School of Theology and Senior Vice-President for Academic Administration at The Southern Baptist Theological Seminary and as preaching pastor at Highview Baptist Church. He is a senior editor of Touchstone.